Every day, Disabled and older people have their lives restricted (or are even trapped in their homes) because transport services fail them. For many, accessible transport can mean the difference between work and unemployment, a lifeline to friends and family or isolation. Let’s change this, so we can all visit family and friends and live our lives without worrying about how to get around. As a member of Transport for All (TfA), you’ll get closer to everything we do and be kept up to date on all the latest local and London-wide transport news, events, campaigns and meetings. Support hundreds of disabled and older people each year to get out and about by offering travel advice on everything from Freedom Passes to step-free travel on the Tube. Take up more complaints when transport providers fail our members. Challenge and win cases to open our transport network to Disabled and older people. Please click on one of the following options. 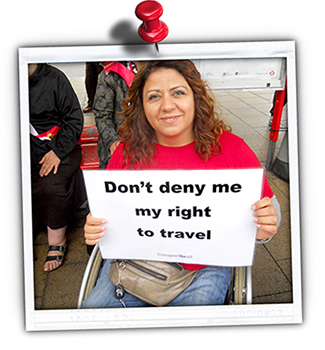 Do not hesitate to contact us if you have any questions: 020 7737 2339 / membership@transportforall.org.uk. Alternatively please check our Frequently Asked Questions section. A welcome pack with your membership card. The member-only e-newsletter OR the member-only quarterly printed newsletter (posted to those not online) and other communications; containing the latest accessible transport news, campaigns, meetings, events and consultations. Priority booking at TfA’s events (including our Pan London Mobility Forums). Invitation to TfA’s Biennial General Meeting and an opportunity to set the direction of the charity. A welcome pack and membership card. Notice of local, London wide and national transport access consultations that your group can feed into. Opportunity to have a TfA speaker and a transport surgery at your group events. Priority booking at TfA’s events. Invitation TfA’s Biennial General Meeting and an opportunity to set the direction of the charity. TfA member networking meet ups.